Formulation: Extracts of melissa, daisy, anthyllis, witch hazel and carrot soothe, working to balance the skin’s natural oil and water content. Tapioca starch provides an even, matte appearance. Skin Condition: For combination skin. I use this in warmer/humid weather w. a drop of the clarifying day oil. It's a perfect combo. It keeps my skin looking bright & not greasy. I only use the color correcting powder over the day cream. I no longer use foundation. In just a few weeks of using the day cream, my skin is brighter, softer and my red, blotchy skin tone has evened out. Smells delicious. Love this product! I was looking forward to something light and non-irritating, but unfortunately it did not agree with me and I even broke out around the temples. I will keep using it in other climates to see if anything changes, but this is my impression after a few uses. Melissa Day cream is light weight in application but provides a great deal of coverage and protection against environment. I no longer need to carry oil absorbing sheets or powder as this perfectly balanced moisturizer lasts all day without being greasy or shiny. I am wearing a lot less makeup these days after switching to this moisturizer and the night serum! My skin is much smoother and brighter. In the past it was very red, blotchy and uneven with shininess and large pores. I love this lotion. My skin gets dry, itchy, red patches, and this is the only product that has ever cleared them up. I take it with me wherever I go! Great name for a creme! I use this creme when my face is too oily or have breakouts, solid choice, never disappoints. I've used this cream for the past four years and it's left my skin feeling hydrated and healthy. Love it. This is my sisters favorite cream and I borrowed it because I didn't have my usual Rose Day on hand. Lovely fragrance! Quince day cream gets swapped for this solution to my more active skin which still needs help with hydration. Great effect. This cream is pretty good on my combination skin, I love the smell too! I have combination skin and I like this day cream a lot. Its not as rich as the Rose day cream. The only con is I feel that I have to use a lot to fully moisturize my face (so the tube runs out so fast!). I've been using the cream with a few drops of the clarifying day oil to help make the product last longer. If you'd like to discuss products for your skin condition, please give us a call at 800-247-9907 9am-noon and 1pm-4:30pm Eastern Standard Time, Monday through Friday. Like this moisturizers a lot. It is light and creamy, and helps to balance my combination skin. I gave it 4 stars because I wish it gave just a little bit more help with the matte appearance, especially since I love the foundation, but it is very rich for the summer. Finally an effective moisturizer that does not cause break outs. I use this every morning with and sometimes at night around my nose when it is extra dry. Light (yet actually delivers lasting moisture), integral ingredients make it smell nice, and not perfume-y. When I started using the Melissa Day Cream, my skin was flaky and irritated from other products. This product calmed my skin down and has kept it perfectly hydrated. I also love love love the smell. Melissa Day Cream works very well with my sensitive combination skin. I can't give it 5 stars because it doesn't quite do the job in harsh winter months, but overall it is a fantastic choice for anyone who has sensitive skin that is combination. Leaves me with a moisturized, but not oily or shiny face. This is a great everyday moisturizer for combination skin. It doesn't break me out and the smell is SO WONDERFUL! I love the way this day cream makes my skin feel. It is light and doesn't make my skin feel oily at all. I love this moisturizer! It does not make my face feel oily at all. Would highly recommend for combination skin. I love and have tried all the day creams. This cream is by far the best fit for my combination skin. I love this moisturizer as it is light and soaks into my skin beautifully. It’s my daily moisturizer during the summer, spring, and fall months. The soothing cream also smells beautifully so that I love putting it on. Super light and at the same time skin feels hydrated. Smells good. Smells lovely. Doesn't feel greasy. Even in a super dry winter climate, it leaves my skin supple and wonderful feeling. I apply w/ the Tinted Bronzer. It does wonderfully as a hydrating cream. This winter I've suffered no dry skin due to the harsh elements. I have to credit this to this amazing hydrating cream. This cremes has a lemony smell. It is very light and airy. it does not seem to be as moisturizing as the Rose Day creme so I will continue with that. 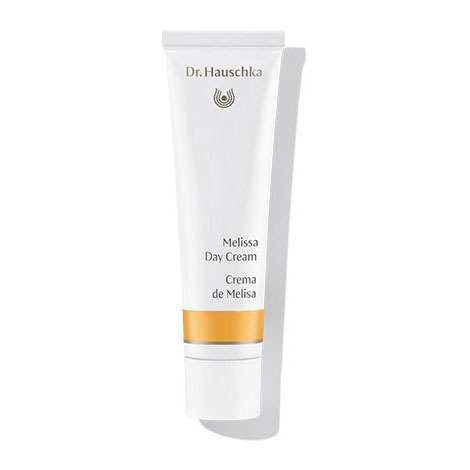 The Dr. Hauschka Melissa day cream has been my daily moisturizer for a couple of years now. My face feels so hydrated after my morning application. It soaks in beautifully and doesn't not leave my skin oily. My skin is very sensitive and this product really helps. I've been using it for years, works for my skin! Melissa day cream has been my go to for several years now. I have sensitive combination skin and it works great - is soothing & nurishing and my skin likes it. I like it - I rub it in and it disappears. In order to cover my face and neck I have to use more than with the Quince Cream. It smells good - someone gave me a hug the other day and commented on how good I smelled - it was the cream. Makes my skin so silky! This day cream makes my skin feel so incredibly silky but not weighed down. It does not make my face look oily either, which I appreciate since I have shiny tendencies on my T-zone. Overall, a great addition to myDr H skin care routine. This product left my skin greasy, so if you are more dry than oily, this may work for you. I would not recommend if you are sensitive to products, even just a little on occasion. It made my skin irritated and red all over. This day cream is so calming and soothing, it's the only moisturizer that doesn't cause a reaction or breakout on my sensitive skin . I've been using it everyday for a couple of years and love it. Also the smell is amazing, so uplifting. Love this! I don't often use it because I need a moisturizer with sun protection, but I love it if I'm having a pajama day or just staying inside. Smells amazing and feels good! This cream really works! No more oil skin (use about 2 month). Soooo nice smell. Love it! I BOUGHT THIS PRODUCT, MELISSA DAY CREAM FOR MY DAUGHTER. SHE LIKES IT FOR HER OILY SKIN. FEELS GREAT ON AND WOULD RECOMMEND IT FOR OTHER YOUNG PEOPLE WITH COMBINATION SKIN. The cream is perfect for combination skin. It has a pleasant texture and fragrance. My skin stayed shine free longer. I loved how light this was and it smells wonderful but after a couple of days I had more break outs (I have acne prone skin). I believe it is the sunflower seed oil. I used it for a week and its feel o.k,not much to say about it. Great, light, calming daily moisturizer. It works perfectly on my skin. And the scent of the cream is great. Love the scent and the way it leaves my skin. Excellent for all seasons. I love the Melissa Day Cream. It moisturizes my skin without leaving a greasy feeling. I absolutely love the Melissa day cream as well as all other products that I have tried so far. They actually deliver what they promise and my super sensitive skin thanks them! Beautiful cream and amazing smell! 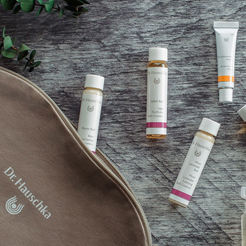 I have used Dr. Hauschka for more than 30 years. I use the Melissa Day Cream on a regular basis, along with the Revitalizing Day Cream and the Soothing Cleansing Milk. The Melissa cream has the best smell imaginable. My skin is always hydrated and soft as silk. I don't even wear much makeup anymore! I have combination skin that is also pretty sensitive so it has always been quite difficult for me to find a moisturizer that doesn't irritate my skin, make me break out or leave my skin feeling dry. Melissa Day Cream is the perfect fit for my skin and I love the smell! This cream is perfect for my combination, aging skin. I live in Florida where it's warm much of the time, and this product is great because it's not too oily. Ideal for daily use on combination skin. Each morning after cleansing and toning, apply evenly to face, neck and décolleté with a gentle pressing motion. In general, a pea-sized amount offers enough product. For maximum benefit, apply while skin is still moist from toner. If breakouts and frequent blemishes are a problem, substitute Melissa Day Cream with a mixture of Revitalizing Day Cream and 1-2 drops of Clarifying Day Oil. In the evening after cleansing, tone with Clarifying Toner then apply Night Serum as your final step. For deeper nourishing care, we recommend weekly applications of Revitalizing Mask.